"I am a self taught mosaic artist who has been creating beautiful pieces for my home and garden since 2001. I fell in love with gardening after setting up my home in a small coastal town in Washington State. I couldn’t get enough of the colors, textures, patterns and the lovely fragrances, so pleasing to the senses! Mother Nature had done her "perfect" part, now I wanted to join the fun. I started out creating numerous mosaic pieces such as; pots, stepping stones, picture frames, votive holders, outdoor wall hangings, and much more..... I was hooked! One day in 2010, while in the garden, I noticed a gorgeous flaming orange dragonfly flitting around the garden, so of course I followed it. Admiring the brilliant coloring and stunning iridescence, I gazed upon its petite magnificence for awhile until she decided to move on...little bugger. I returned to my studio a couple of days later and noticed a rock I had held onto for awhile knowing that I would do “something” with it someday. Why not put a dragonfly on it!! I did and I loved it. I see the creation of the Dragonfly Rock as a gift from nature! For that I am forever grateful. Through the years I have perfected my personal technique and have developed a very beautiful, eye pleasing form of garden art. 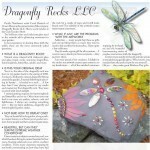 I Love being able to now share my talents with everyone through my Online Dragonfly Mosaic Rocks Class! 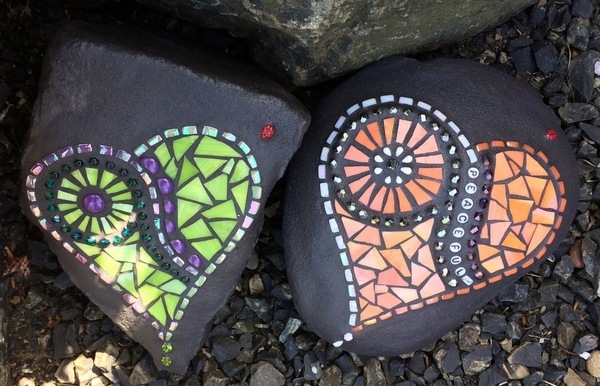 Carol Deutsch is an award-winning mosaic artist who’s durable, dazzling garden rocks are available at select shows in the Northwest and now available online. Over the years, multiple requests from delighted purchasers of her Dragonfly Rocks led to the creation of a whole range of enchanting designs including hummingbirds, ladybugs, hearts, butterflies, and the list just keeps growing . Her latest creation is the Dragonfly Rocks Online Class, where she will guide you in designing your own gorgeous pieces! She creates her rocks in her home studio, inspired by the ever-changing brilliant colors of her garden. Click on the thumbnails for some of the recent press about Carol, and the answers to some Frequently Asked Questions. For information about creating the perfect rock for your garden, visit the ordering page.